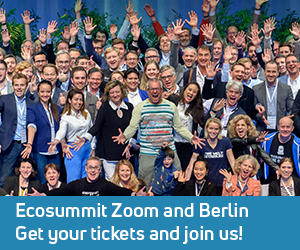 Archive for tag "Clean Capital"
Ecosummit and Taylor Wessing, the international law firm with extensive cleantech and private equity experience, joined forces to invite you to a high-voltage evening of Smart Green Business Networking. 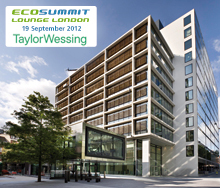 Our first Ecosummit Lounge London takes place on 19 September 2012 at Taylor Wessing’s spacious London office. At the lounge, we will enjoy a keynote by Niki Rosinski, Partner at Generation Investment, talking about Sustainable Capitalism, 6 startup pitches by SolarFuel, Sefaira, Carzapp, Ventive, EnergyDeck and Ecosummit, tasty drinks, finger food and all that Jazz. 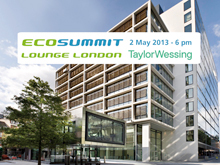 Tickets for the Ecosummit Lounge London are available for £30,00. The amazing list of participants is included at the bottom of this article. We look forward to seeing you in London.